It wasn’t that long ago that I posted this painting, and I am writing about it again already. “Burden to Bear” has recently sold and is now in its new home. This is an acrylic on canvas from my “In Our Veins” series. I won’t go into too much detail seeing as I just wrote about it, so if you missed the previous post, just scroll down a little and you can read up about this painting. The image is small, so to get a better view, visit my website at this direct link: www.AmyGuidry.com. And for anyone new to the site, there is still time to sign up for the chance to win one of my New Realm 5″ x 5″ paintings. Sign up for my monthly newsletter on the Contact page of my website. One person out of the first 200 to sign up will win! The direct link is here: www.AmyGuidry.com Sweepstakes. I’m thankful to everyone that has been/is so supportive and encouraging of my art career. I’m thankful to everyone that is a “fan” (or “like”- Facebook keeps changing it) on my Facebook Fanpage. Your support has kept me going over the years and continues to do so. THANK YOU!! I have some great news to share- if you may recall, I had a solo exhibition earlier this year at the Schepis Museum in Columbia, LA. Well, my work is now in their permanent collection! I am honored that I am the first artist in the southwestern area of Louisiana to have their work included in the Louisiana Artists collection at the Schepis Museum. My painting, “Jenny,” is now in the collection and is one of my earlier works from 2005. It is an acrylic on canvas, 13″ wide by 16″ high, framed. As mentioned before, such small photos don’t do the work justice, so be sure to get a better look on my website. The direct link can be found here: www.AmyGuidry.com. Also, don’t miss out on the opportunity to win one of my paintings! Sign up for my newsletter to be entered to win a work from my 5 x 5 New Realm series. Just click on the direct link and enter your email address for entry- www.AmyGuidry.com Sweepstakes. 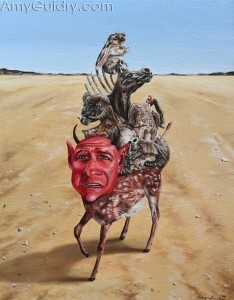 I have a new painting to share- “Burden to Bear” (hmm, rhyming not intentional…). So I’ve been putting in some extra hours in my studio- sounds nicer than “overtime.” Anyway, this is another addition to my “In Our Veins” series and is an acrylic on canvas, 11″ wide by 14″ high. There are a lot of tiny details in this one that don’t translate well via jpegs much less a tiny photo on here. You can get a better look on my website. I love to hear what others feel about my work, but I’m going to go ahead and share a few of my own feelings about this piece. I am a vegan, and that does influence my work in subtle ways, some more so than others. I’m very concerned with the plight of nature and our planet. The animals and bones and skulls seen atop the “deer” are my own personal representations of those affected by the wrongs that we commit against others or the environment (be it land, animals, humans). I decided to keep it organic and not include nonliving things. I should also mention that throughout this series, pay special attention to the animals. Many of them have “human” qualities- such as animals with what would be considered “human-looking” eyes, or expressions, or their posture. I felt this gave them more significance, as I certainly consider them to be important. And to view the painting, please visit www.AmyGuidry.com. I’m sure you’re thinking that’s an interesting title… It’s actually the name of an upcoming show I will be in next week. “Like a Prayer: Reflections of the 21st C Feminine” is a group exhibition that will open November 13th at Barrister’s Gallery in New Orleans. The show was curated by Martina Batan, the director of Ronald Feldman Fine Art in New York. I’m excited to be in this show due to the lineup of artists as well as this being my first exhibit at Barrister’s Gallery. The opening coincides with the Artwalk held in the St. Claude Arts District of New Orleans. In addition, if you may recall, this is also the opening night of the Multispecies Salon, which I am also included in. (No worries, both events take place in the same arts district.) Prospect 1.5 (preview to the Prospect 2 Biennial) will also be taking place during this time, so numerous galleries, museums, and alternative spaces have events scheduled. So if you happen to be in New Orleans this month, now is a great time to check out the art events. “Like a Prayer” will be up November 13th through December 30th. The opening reception will be held from 6-9pm. 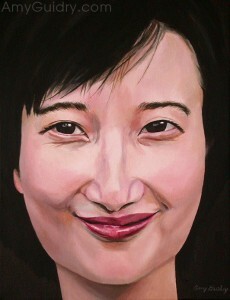 For more information, visit this direct link to Barrister’s Gallery. 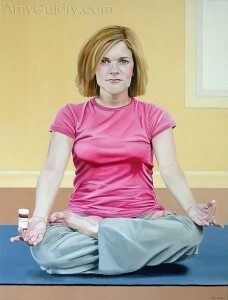 For more information regarding my work, visit www.AmyGuidry.com.